MTB routes – Routes through Palafrugell, Calella, Llafranc, Tamariu and Llofriu-Ermedàs. The different mountainous areas of the region offer great potential for this sport. Taking advantage of this potential, the Baix Empordà Regional Council has created an MTB Centre approved by the Catalan Cycling Federation and by Catalunya Turisme. 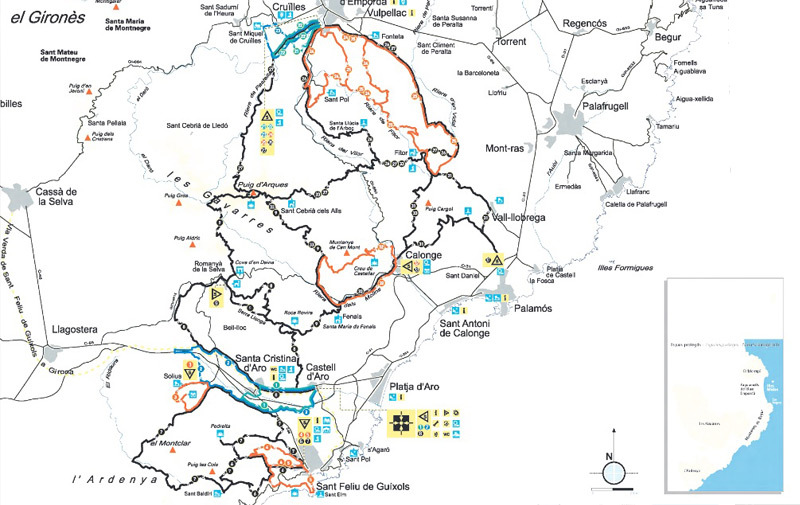 The Baix Empordà MTB Centre has a total of 19 routes which connect up, allowing a multitude of kilometres (326 km) to be done of different levels and technical difficulties. The Centre has a welcome point in Castell d’Aro, where all of the necessary and complementary services are offered for doing MTB (bicycle rental, workshop, showers, bicycle washing point, professional guides, tourist information…). There are different starting points in villages around the Gavarres and Ardenya hills. For further information on MTB in the Baix Empordà, click here.